Bennison in his shop at 91 Pimlico Road, photographed for Town & Country magazine, 1981. Written by long time shop associate Gillian Newberry, who continued Geoffrey’s work posthumously by founding Bennison Fabrics in 1985, we gain entree into his fascinating world. From his time at Slade School of Art where he showed early artistic talent, to his years as an antiques dealer at many London outposts and adventures during the swinging 60s to his career as an in-demand decorator for the most discerning international clients, it is a wild and sumptuous magic carpet of a ride in design. A seventeenth-century portrait of Fernando II de’ Medici by Matteo Rosselli is flanked by two Regency-style green painted library bookcases and a pair of Victorian silver and brass torchères after a design by George Smith. A pair of Chinese Famille Noire baluster jars with covers are arranged on either side of the mantelpiece. 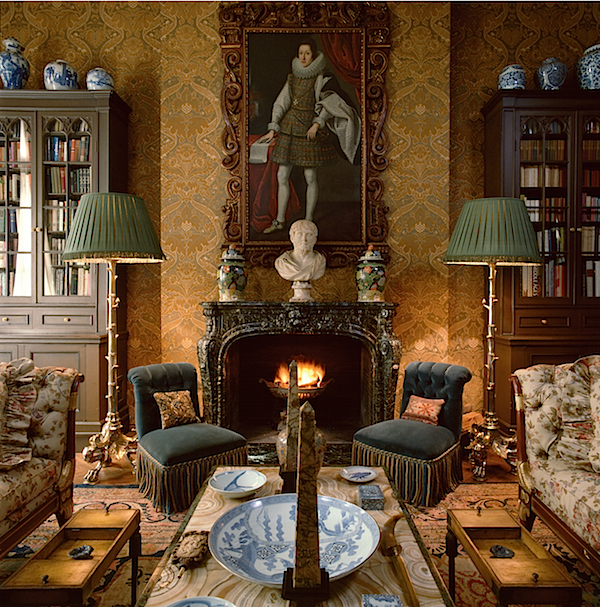 After having completed prestigious projects for clients such as Lord Weidenfeld, the Duchess of Beaufort and an apartment and country house for Baron David de Rothschild, Bennison was approached by Princess Firyal of Jordan to decorate her spacious Paris apartment. His style was not about calculated elegance or accurate period consistency. While well schooled in antiques and provenance, he explained, “I can’t bear the look-what-I’ve-got look.” He was all about creating an aura, as he did above and below, in the princess’s dining room, one of his all time favorite spaces. 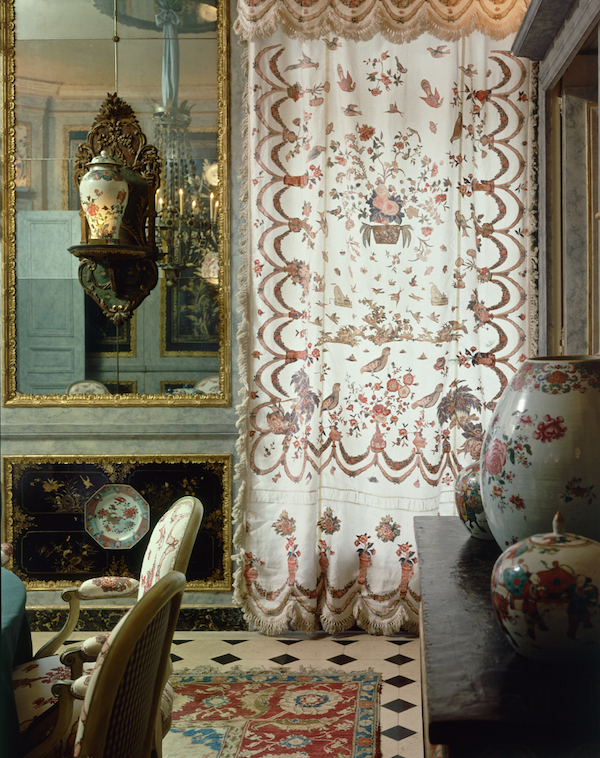 With a talent for “enhancing the qualities of a client’s own collections and furniture (by) integrating them into his vision of the interiors,” he capitalizing on the princess’s collection of Famille Rose and Imari porcelain. 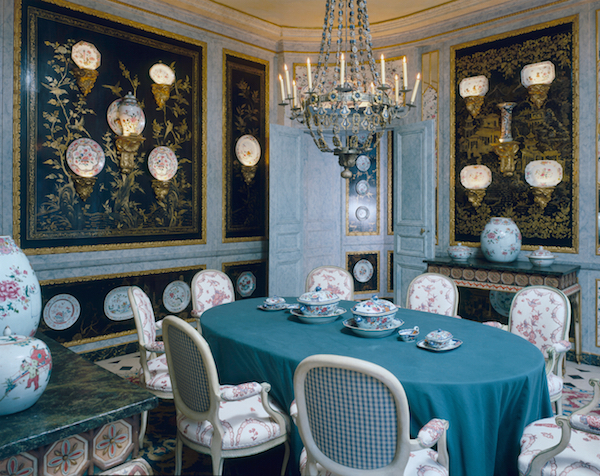 Working with his talented team of artisans, walls were painted in a pale blue faux marbre and the porcelain placed on secretly lit carved giltwood pedestals within framed mirrored or lacquer panels. Design details from an 18th century quilt were reworked into the pattern of new fabric made to cover the chairs and delicately appliquéd on the curtains. As with all his work, the grand salon represented his uncanny ability to imbue the most splendid and luxurious rooms with a sense of cozy comfort and lived-in approachability. 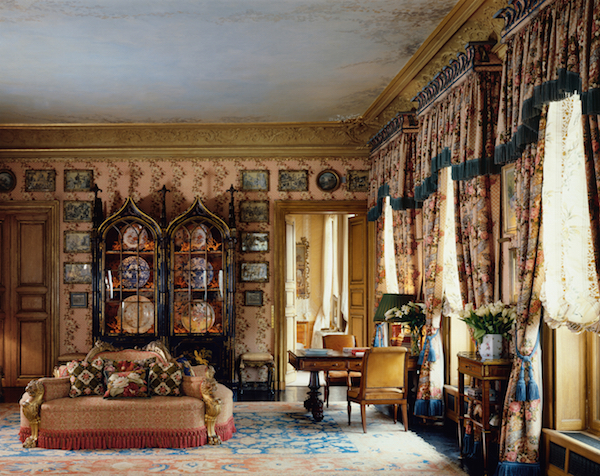 His innate sense of color, balance and proportion informed the space, with a beloved Ziegler carpet on the floor and walls covered in his own Vineleaf fabric on a small octagon background which was based on the curtains, a 19th century pattern from the collection at the Victoria and Albert Museum. These in turn hung over hand-painted silk shades. Bennison adored antique textiles and it was when he couldn’t find modern equivalents with the right tonality that he started to print his own. 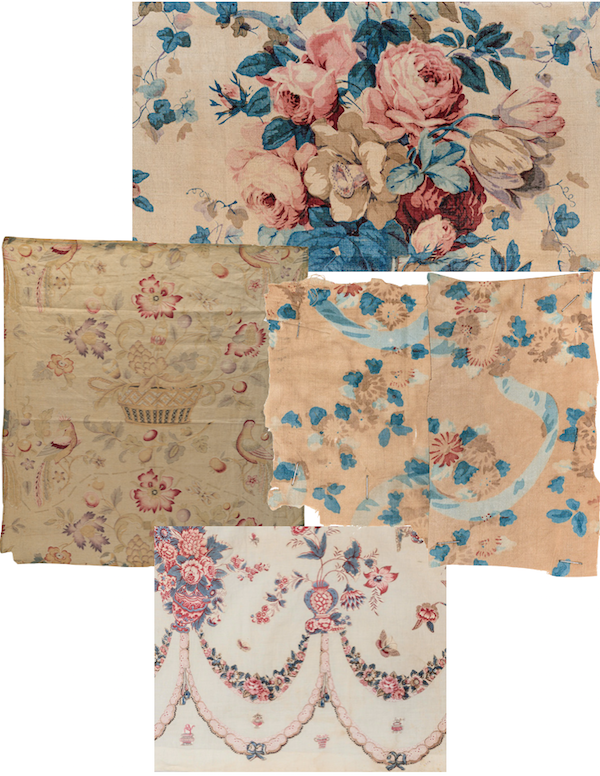 And it was his original list of fabrics from the archives that became the core of the Bennison Fabrics collection we know and love today. Each year, new patterns have been added so that the present archive comprises nearly 200 designs. But it is not just the fabrics that are the legacy of Geoffrey Bennison but the art of the mix. So much of how we approach design today can be attributed to him and there is much to learn and be inspired by in this must-have volume for any design aficionado’s library. This entry posted in art, books, furniture, interior design. 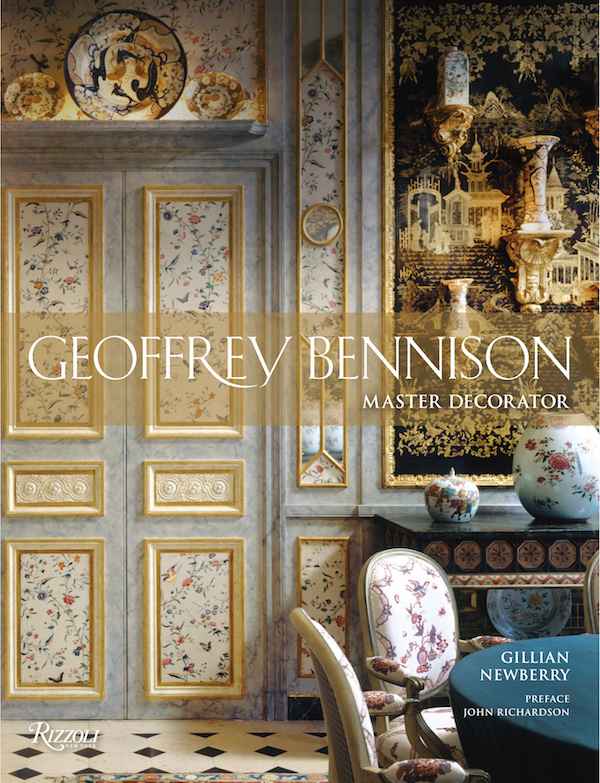 Entry Tags: Bennison Fabrics, Decorating, Design Books, Geoffrey Bennison, interior design Bookmark the permalink. 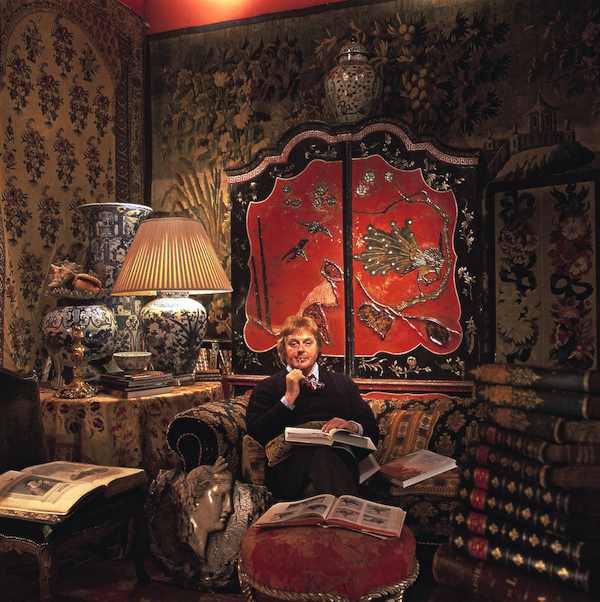 I am a huge admirer of Bennison fabrics – and dream of redoing one of my rooms over in Chinese Pheasant., but I knew nothing of the man behind this wonderful enterprise. Another wonderful post that links for me the intellectual and the aesthetic! I have only one piece from George Smith but I always wanted a Sofa with Bennison fabrics. One of my all time favorites ! Great post, Stacey! So regal and grand yet incredibly approachable. Love the Appliqué Quilt fabric. Thank you for sharing! Stacey, the history behind the man is so fascinating, the book sounds and looks to be a wonder! Stacey I love learning more about the man behind this great company and the books looks wonderful! I had no idea of the story behind Bennison fabrics! I love vintage floral fabrics and am especially delighted when they have birds. Bennison will confound future curators who collect pieces of fabric. They sometimes rely on the puff or fatness of the bird to distinguish among british and french designers. Bennison clearly slims some birds (like the French are more likely to do) and clearly does not others! 80 queries in 0.531 seconds.